Katherine one of our teachers in hub 1 has been working with her colleagues and learners to develop symbols for each of our learner qualities. She has found this to be a powerful way of developing this language of learning for the younger learners. A big focus for us at Stonefields School is to reinforce and give feedback on an individual's effort rather than on the behaviour. For example replace 'you are so clever' with 'I can see that you have been really determined to try a word you haven't used before in your writing'. The child who is constantly reinforced for being 'smart' or 'that's fantastic, you are so clever' can be cautious about taking risks, making mistakes and comfortably taking themselves into 'I don't know situations'. 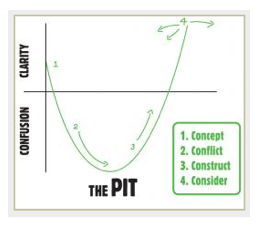 The 'pit' is a metaphor that is used more and more in each of the hubs to show that being stuck (being in the pit) is a good thing. It is the learning process and the learner qualities that are key strategies in helping our learners get out of the pit. We want our learners experiencing being stuck every single day. This is where the true learning starts.